Hundreds or thousands of talented professionals are visiting your company’s web pages every day, but how do you stay connected with these potential candidates over time? Today, LinkedIn is launching a powerful new way to stay in touch by inviting these professionals to follow your company on LinkedIn in just a single click. The Company Follow Button is a plug-in you can add to any web page, including your company home page or career website. Visitors to your websites will be able to start following your company's status updates with the literal click of a button. Followers are a tremendously valuable pool of talent for recruiting teams. These are professionals—many of them passive candidates—who want to learn more about your company. Company Status Updates give you a direct line of communication to these followers. You can share job opportunities, articles about your company, or info on exciting initiatives your employees are working on. These messages appear in the network update stream of every follower’s LinkedIn homepage and go viral as members Like, Share and Comment on updates. 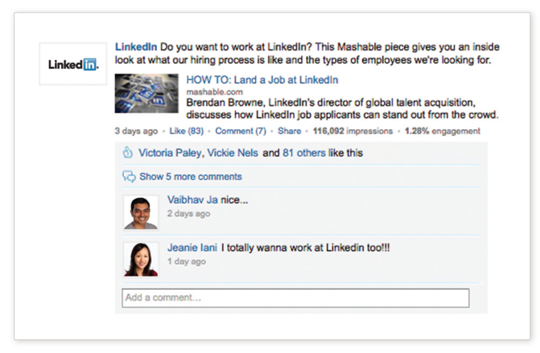 Followers will also receive automatic updates any time you post a job that’s relevant to them. Leaders at companies like Starbucks and Sony Electronics plan to be among the first to implement the button. “We’re excited about adding the Company Follow Button. Candidates are more apt to have jobs-related conversations and network on LinkedIn than on other platforms, and we’re looking forward to connecting with more of them,” says Jeremy Langhans, Starbucks' Employment Brand and Channels Program Manager. Add the Company Follow Button today and give interested candidates an even easier way to stay connected. It only takes a few minutes to set up. Click here for more information and step-by-step instructions on getting started.